This picture is of Totsi, a very desirable model. Totsi is a Limited Release and is absolutely gorgeous. No wonder she has been seen to sell online as high as $800. The Breyer Company always seems to outdo themselves with creating passion of collecting their models. Totsi was given to the volunteers who helped with BreyerFest 2008, which is quite an undertaking itself I am sure. 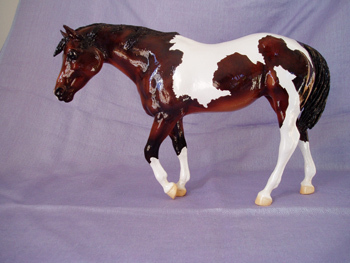 Totsi is a Bay Tobiano Pinto, done on the Indian Pony mold in High Gloss. All of these details, along with the fact that there is a very limited number of her made, make her a model that will hold her value very well over time. This photo comes to us from Deb Marshall who has been an avid Collector for many years. Thank you again Deb for your help.